I'm really trying to psych myself up for oil painting in Taos. It's like a different world from painting with acrylics and no lines. The oil paint is so buttery and I don't like using any medium, so it goes on thick and rich. It is much harder for me - I'm a messy painter anyway and if I paint in my car (which I've done when the weather was bad) it's hard to clean. I reallyadmire people who use oils consistently as a medium. I'm also used to using the same colors and I can't get them to match my acrylics the way I want them to. I just realized I am sounding like a crybaby! I am going later to choose new paints, maybe a limited palette, and I iwll let you know what I come up with. If you click on this painting, you can see up close and personal the brushstrokes and how wet it still looks, even though it was done last year. Dee - try water miscible oils. Windsor and Newton makes a really fine one. The texture, colors, drying, etc., are exactly like regular oils, it's just that they clean up with soap and water. They are perfect for plein air. 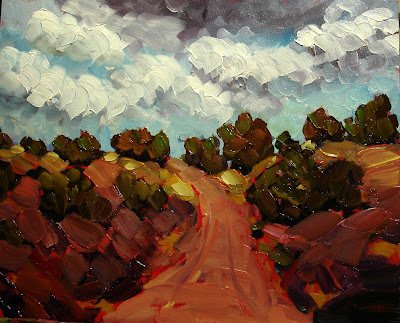 Use a knife instead of brushes, and you're in plein air heaven!